Kim received a letter last week inviting her to be on Law Review. For those of you who don’t know what that is, being on Law Review is the goal of pretty much every law student at any school in the country. It is one of the highest honors you can receive in law school, and only the best and brightest of every class are invited to join. This reflects Kim’s hard work, and her general genius. Congratulations Kim, you totally deserve it! 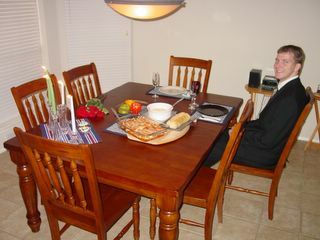 We just got a new dining set, and we totally love it. We’ve kind of been looking at dining sets for a while, but we never found one we really liked. This one however, is perfect. We like everything about it, from the design, to the color, to the traditional style chairs, to the butterfly leaf. Here’s a picture of it with the amazing birthday dinner Kim cooked me. You should really try some of this garlic artichoke dip, it was phenomenal.